Although we can't be certain about the location or severity of the upcoming Zombie Apocalypse of 2014, we have a fairly good idea what it's going to involve: there will be zombies, brains will be eaten, civilization as we know it will end, and people will need to be resourceful. And also, obviously, we know it's going to happen sometime in the year 2014, 'cause otherwise the name makes no sense. 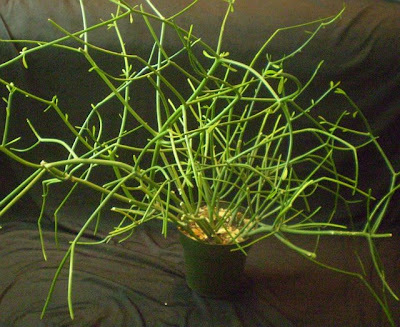 Though food-producing plants like potatoes and corn will be of primary importance in the days and months immediately following the rise of the zombie menace, there are other plants, including many sometimes grown as houseplants, which may also prove useful in obvious and non-obvious ways. I have collected a list here. The reader may wish to acquire and begin growing several of these immediately, just to be sure to have enough on hand when the time comes: we only have four years, give or take, so people may need to start propagating some of the slower-growers now. Please leave a comment if you have any additional suggestions. I'm very interested in everyone's thoughts about the subject. 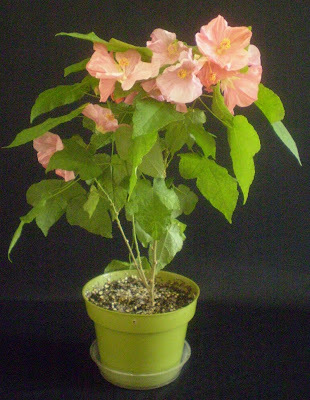 Abutilon cvv., with their relatively broad, fuzzy leaves, can be used as toilet paper, according to my dad. He was referring to Abutilon theophrasti, or velvetleaf, a common agricultural weed here in Iowa, but I'm pretty sure the more ornamental Abutilons would work. And who wants to survive the zombie apocalypse without toilet paper, am I right? Agave species can be planted near the home as a first line of defense against zombie attack. Obviously Agaves will not kill the zombies, since zombies are already dead, but it'll slow them down -- the spines can snag clothing and body parts, slowing down attackers, and in the case of sufficiently dense plantings, attacks might be stopped altogether. In areas where Agaves are not hardy, they may still be useful houseplants: the terminal spines of Agave leaves may be removed and used as sewing needles, and the fibers of dried leaves can be spun into coarse but strong ropes. 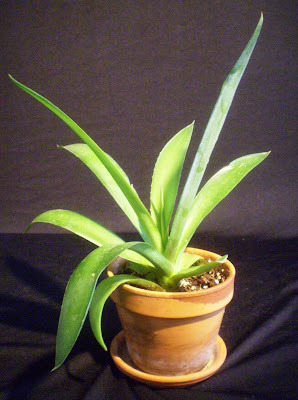 Larger species like A. americana are most efficient for such uses, but other Agaves can be used as well. 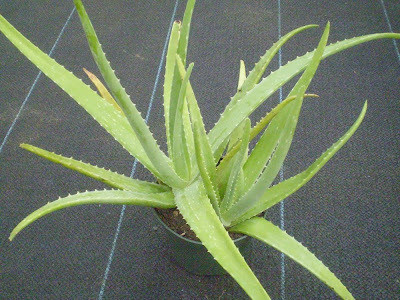 Aloe vera is widely respected for its ability to soothe and heal burns, which is very useful if your zombie defense system includes flamethrowers. As your zombie defense system should. Zombie-resistant fortifications are likely to be airtight or nearly so, both to keep out the stench of rotting zombie parts on your Agave-planted perimeter and to keep zombies from detecting the presence of your delicious, delicious brains. 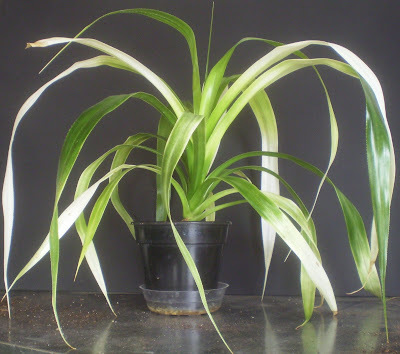 Plants like Chlorophytum comosum will help to improve the air quality of such tight quarters, decorate your living space, and continually produce oxygen so you don't accidentally suffocate while hiding from the zombies. Cissus quadrangularis has been used, historically, to speed healing of broken bones and injured tendons. It is currently used in dried, processed form as a dietary aid among the bodybuilding community. 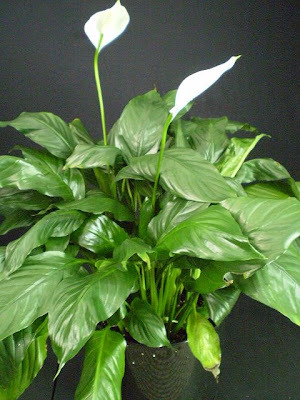 Dieffenbachia canes, when chewed, cause pain and swelling in the mouth and throat, potentially leaving the victim mute for extended period. Fed to zombies, this will quiet their moans of "Braaaaaaains! Braaaaaaains," enabling you to sleep comfortably, safe in your defensive bunker. Effective as your defensive perimeter of Agaves may be, the zombie body parts they accumulate will begin to stink and rot over time, and with stink and rot come flies. Dionaea muscipula, in large enough quantities, can eliminate said flies and protect you against the diseases they transmit, as well as the annoying buzzing sounds they make as they fly around. 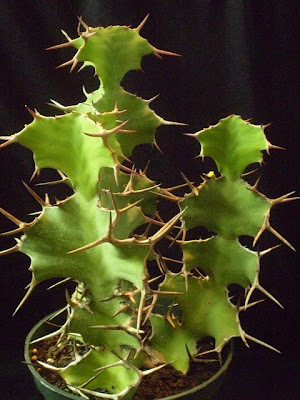 The thorns and sap of Euphorbia grandicornis are capable of deterring or capturing zombies, as with Agave spp., preventing them from getting close to your bunker. 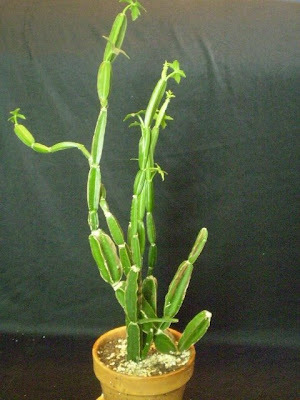 In the event that the zombies breach the Agaves and/or Euphorbia grandicornis, your first line of defense, you can use Euphorbia tirucalli as a backup: when the sap contacts zombie (or human) eyes, it causes temporary blindness and searing pain, potentially for several days, enabling you to repel the attack or relocate with significantly less risk to you and the other survivors in your bunker. To use, simply cut a few branches of the plant and fling them repeatedly in the direction of the zombies until sap contacts the zombies' eyes. (WARNING: Do not fling sap unless you, and all humans in your vicinity, are wearing goggles or other protective eyewear. Wash all exposed body parts extremely well following the use of Euphorbia tirucalli in defense.) Additionally, processed sap of this plant shows potential as a fuel source, which may be used to power generators or vehicles. This is likely critical, since power plants and oil refinery operations will likely shut down shortly after the existence of zombies becomes public knowledge. The sharp marginal spines on Pandanus can deter or slow zombie attacks, as for Agave spp. The leaves can be dried and spun into ropes, or used fresh as a water-repellent shelter for food or other valuables. Some Pandanus species, like P. amaryllifolius, are used in cooking to impart a sweet flavor and aroma to cakes, breads and meat dishes. As for Euphorbia tirucalli, though less effective as a form of defense and possibly more effective as a fuel source. 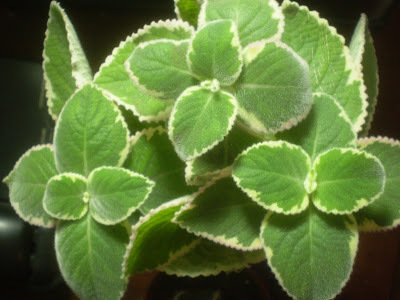 Plectranthus amboinicus has a pungent odor similar to oregano, and is used as an oregano substitute when cooking. As spices will probably be difficult to come by once civilization has shut down, this is a cheap way to maintain a little bit of flavor in one's diet. The smell is extremely strong, and may partly mask the odor of rotting corpses from the front lawn. The oil is said to be effective at relieving arthritis pain when applied directly to the skin. As a very tolerant plant which grows quickly, it also has the ability to clean and oxygenate the air, as for Chlorophytum comosum. Spathiphyllum spp. 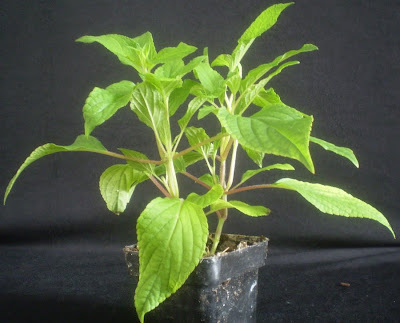 are relatively easy-care, attractive green plants with a high capacity for air filtering and oxygenation. They are frequently given as funeral gifts in pre-apocalyptic America, and may be useful for expressing condolences to other groups in other bunkers following zombie attacks, facilitating trust between survivors and forming bonds which will help to rebuild civilization after the zombie threat has been eliminated. P.S. in response to criticism on a forum I don't want to register for just to make this one point and then never visit again: Yes, I know none of these would survive outside in a northern winter. "Houseplants" is in the title for a reason. The reason being that sometimes they would have to be grown in the house. As one does with houseplants. I'd like to offer up Dioscorea bulbifera, or air potato. Planted in buckets next to the boarded windows, air potato vines can find their way out through chinks and cracks, enveloping your house in luxurious green canopy. The canopy might enhance the air of abandoned desolation, thus discouraging the still living two-legged predators from their search for gasoline and candy. The tuberous roots of this plant are also eatable. I love this post! There are so many plants that would prove invaluable in the coming zombie threat, so thank you for singling some out for us. I've added them to my list and I think I'm ready. I love the use of toilet paper and the social implications of Sapthiphylum during a zombie outbreak! Do we have any idea where it begins? Now I know most people here realize that the Dieffenbachia is not good to ingest, but I'm scared some googler might be directed here that has a little less knowledge and only skims through the post. I don't know if that fear is warranted but I thought I'd bring it up anyway. Maybe I'm just paranoid. Armed with Chlorphytum and Pineapple Sage, I feel quite prepared. I see the problem, and don't think you're being unnecessarily paranoid, but I don't know what more I could add to pain, swelling and muteness that would make anybody less likely to try it. Goodness... I'm realizing how ill-prepared I am. I need to start buying toxic, spiny plants right away! Re Dieffenbachia: One of my professors when I was an undergrad liked to tell the story of the student who, upon learning about its effects, decided to try it. Right in class. It is called DUMB cane for a reason. I don't seem to be very well prepared at all! Guess I'd better start picking up Agaves quick! Opuntia species could be used outside where Agaves aren't hardy as a defense though not sure on their usefulness as a houseplant necessarily (though you do have Agaves on your list so these should count too). Additionally both the pads and fruit can be eaten (on some species anyway). I don't have a problem including Opuntia spp. on the list. I've seen people keep them as houseplants before, and the defensive/offensive applications are obvious enough. Plus: food. And maybe also food for livestock. I don't think I'll be keeping any at my bunker, though, because of how they're evil. Awesome post. Without this resource I'd have been reduced to trying to block the advance of zombies with dense stands of corn plants, which I fear would not be nearly as effective. Any connection to the video game "Plants vs Zombies"? Of course the creators of that were reduced to using made up plants. Maybe not as effective, but keep the corn anyway. We'll need to eat something. I'm aware of the game, but have never played it and only know what it's about in the vaguest sense. This post comes from my free-association in the comments of a Greensparrow Gardens post. I only have a few of these plants... I have traditionally relied upon my machete to protect me from zombies, but any extra help is great! I think Dracunculus vulgaris would be an excellent addition to the Zombie Apocalypse of 2014 arsenal. The incredible stench that will accumulate due to Agave/Euphorbia/Pandanus-dismembered walking corpses may deter other zombies from stopping by your dwelling--it'll mask the scent of your delicious brain! If your property is going to stink anyway, a patch of blooming D. vulgaris could make the zombies overlook you to begin with. Such plants could be offered as housewarming gifts by parents and parents-in-law who really want to get their marriage-aged children out of the house. These smelly plants will protect the new couple in their new house while the perimeter defense system is getting established. Well, damn - I knew we shouldn't have given away the spiny monstrosity that was once a cute little Agave americana brought back from the summer holidays. I do have plenty of potential toilet paper, though, some Aloe, a couple of Chlorophytums (just recently started propagating, in fact), a Dieffenbachia and a small Pandanus and Yucca. Which, in four years, should be quite big enough. My 13-yr old son is going through a book called "The Zombie Survival Guide" right now -- will have to check if it includes anything about the plants mentioned here! Oh! I've read that! I don't remember if there was plant content, but I read it. If your son hasn't already read it, the same guy wrote World War Z, which is sort of a series of zombie-related short stories that all collectively tell the story of the zombie apocalypse. Though it doesn't specifically say it happens in 2014. Recommended. Sheesh, and I thought cornmeal, powdered milk and a sharp ax was all I needed. I've got some plant shopping to do! I especially like the idea of luring hummingbirds for food. Do you debone your hummingbirds first or do you prepare them whole? I'd assume probably you'd have to leave the bones in. Calcium, you know. Also if you were desperate enough to resort to trying to trap hummingbirds for food, you probably can't afford to throw anything out. Though I wonder about hummingbird-plucking. Would you have to? I suppose you would. It'd be like, "Ma! Get yer magnifying glass and tweezers; I done caught us a whole flock a hummingbirds for dinner!" You know, this is the first zombie-related piece of writing I've enjoyed, ever. Your going to need Bromeliads for water holders/carriers!! and maybe Ricinus communis for poison and shelter! Colocasia esculenta for shelter and food for sure!! The leaves can get huge! This may be the most inspired post of many inspired posts you've written, MrSub. A quick scan around my house shows I have limited chance of surviving the zombie apocalypse, since I have only pineapple mint of your suggestions. My only hope is to cook my brains on moonshine before the zombies reach me, and maybe they'll leave me alone. Well sure; it's the first piece of zombie-related writing that gives you an excuse to buy houseplants. W/r/t Ricinus: who would you poison, though? The zombies are already dead. It wouldn't work. I suppose if you found one of your co-bunker people really annoying . . . but in that case Dieffenbachia would do just as well, right? Unless they were being annoying in a non-verbal way. But I'll add Colocasia, 'cause that's a good point. Well, you've still got four years, give or take. There's time to do some practical houseplant-buying. Awesome post, and nice list!!! A 2nd thumb up for World War Z. Brilliant, not too gratuitous, and a great survey of current geopolitics. Citrus oils can be used as cleansers and disinfectants. Maybe an early fruiter like the meyer lemon? Mine is 3 and I've picked lots of tiny fruit off it to let it grow. Starting with a larger plant form the greenhouse, and having 4 years to grow, I imagine one could get a fair amount of rind. (Not to mention the pulp, to add vitamins to the preserved- foods diet. But that's getting into edibles, which may be beyond the scope of this post). I got my very own Dieffenbachia today. It was a choice between that and a Sansevieria, and I figured defense comes first. There is a book called "The after dinner gardening book" How to grow food-producing house plants from the food you have been eating. Loads of fun. Foe example, Avocados make nice trees and the dried leaves are good as a seasoning. Most dried hot peppers have seeds which will sprout as do catnip, oregano and poppy seeds from markets. Watch out for dieffenbachia! I was working with it in a garden shop once and ended up with burning, tingling and numbness in my hands for several hours. Make sure you're wearing gloves if you might have a sensitivity. The article doesn't mention it, but branches of the ocotillo plant will root if planted and watered. Settlers in the southwest used to plant rows of the branches to create living, eight-foot-high fences covered in one-and-a-half-inch spikes. And if it's rained recently they will grow leaves, effectively camouflaging the needles. And they're tall enough to provide shade! Thanks for the welcome for Homegrown Evolution readers! 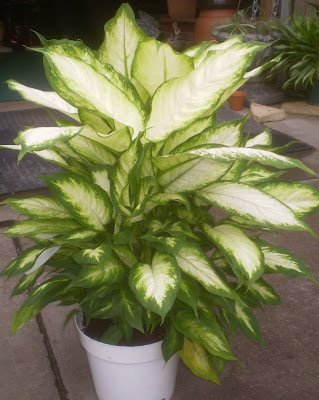 I've a question on the subject of toilet paper and dumb cane: can diffenbachia be used as toilet paper, and would it work like Tucks? Neither, I think. The leaves' texture is pretty slick, so it wouldn't work very well as toilet paper (though the leaves are bigger than Abutilon by quite a bit, so on that one count it might be better), and if the sap contacted one's more sensitive parts, I don't see it acting like Tucks so much as like fire: the leaves, like the rest of the plant, are full of sharp needles of calcium oxalate. This is why chewing the stems is so irritating that it can cause your mouth to swell until it blocks your airway. I'd think the location in question is the last place most of us would want to be swollen and painful. We need to stock up on some houseplants. How could you miss out the Zombie Cucumber (Datura sp) which was used in Haiti to control zombie slaves? Might as well get them working for you if they are infesting the place. Kudzu. It will fill in any holes in your defenses within days, and cover up all those unsightly zombie parts. And within a few weeks the zombies would need machetes to even approach your house. I love the photos of the Dieffenbachia. Love the blog, thanks for the wit and the unexpected interest you've sparked in all (most)(many)(some) things horticultural.